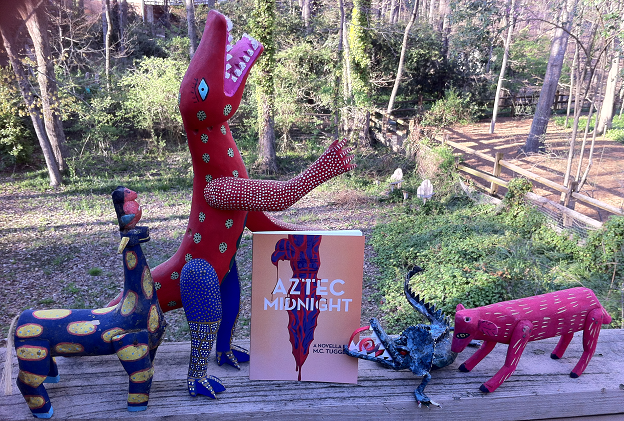 Aztec Midnight now in paperback! What are the Alebrijes so excited about? Their favorite novella, Aztec Midnight, is now available in paperback from Novel Fox. Of course, the Kindle version is cool, and it’s nice to be able to carry a library in your reader or iPhone, but there’s nothing quite like the feel of a real book in your hands. That cover is truly a thing of beauty. Now, about the Alebrijes: They’re fantastic monsters folk artists in Oaxaca carve from copal, a wood Oaxacans believe is magical. Some, such as the lizard monster center right, are made of papier-mâché. They were “discovered” by the traditional art world when a gallery owner from Cuernavaca (where much of the action in Aztec Midnight takes place) started buying them in the 1930s. Mexican artists Diego Rivera and Frida Kahlo found inspiration in them and helped further popularize them. The magical creatures shown above are from my wife’s collection. Congrats Sir! It must be a great feeling! I was looking at the book cover keenly, it is so animated! I was delighted to find the book available at amazon.in, that is, the Indian Amazon site. In Indian currency, it is moderately priced. (Some books get overpriced because of overseas shipping costs) I am already looking forward to own one copy!